INCREASE YOUR PROTECTION AGAINST CRIME……WITH CX5’s INNOVATIVE TECHNOLOGY! CX5 high security technology starts with the unique waved security groove side milling on the key. This innovative concept activates internal side pins which control an auxiliary locking bar. 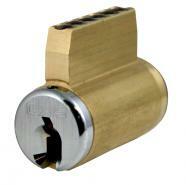 The security groove allows for hundreds of possible independent keyways for each key profile. CX5 key control policies are strictly enforced and keyways are geographically managed preventing the widespread availability of specific key blanks. Duplicate keys are obtained with an authorization card and signature verification. CX5 cylinders have a secondary point of locking control which results in a key cylinder that is virtually bump proof and pick resistant. CX5 cylinders are made with enhanced internal protection features of hardened steel pins. This decreases the likeliness that top pins or sidebar pins can be compromised by drilling or other physical attacks. All CX5 Mortise Cylinders are produced from high quality solid brass extruded rod material and are available in most popular architectural finishes. By default, cylinders are shipped without key blanks and with no sidebar pins installed. The pin tumbler chambers are “0-Bitted” with brass top and bottom pins. The top springs are made from stainless steel and the chambers are capped with set screws for easy pinning. CX5 mortise cylinders can be converted to RIM cylinder with the CX5 RIM pack. A CX5 RIM pack is included with the 1-1/8 inch CX5 mortise cylinder. By default, the cam A “Adams Rite” cam is installed on all CX5 mortise cylinders. CX5 Mortise Cylinders are available with UL 437 option for enhanced security. All CX5 Key-In-Knob (KIK) Cylinders are produced from high quality solid brass extruded rod material and are available in most popular architectural finishes. By default, cylinders are shipped without key blanks and with no sidebar pins installed. The pin tumbler chambers are “0-Bitted” with brass top and bottom pins. The top springs are made from stainless steel and the chambers are capped with set screws for easy pinning. CX5 KIK cylinders are available with fixed and lazy tailpieces. CX5 KIK Cylinders are available with UL 437 option for enhanced security. Integrate CX5 kik cylinders with DOREX TLA deadbolts to meet ANSI A156.5 Grade 2 requirements. 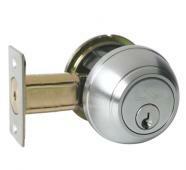 The TLA deadbolts have a standard backset 2 3/4 inch, with 2 3/8 inch (optional). They can be used on doors ranging from 1 3/8 inch to 1 3/4 inch door thickness, with a 2 1/4 inch door thickness option. The TLA deadbolts have a 1 inch throw and are UL listed for use on fire doors. Visit the CX5 website for more information on their great products! 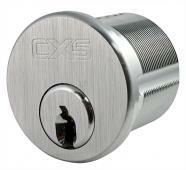 Our government licensed locksmiths can install any CX5 high security lock products for you!